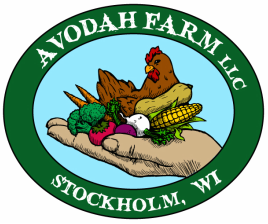 Avodah Farm (pronounced AH-vo-DAH) is a small family farm nestled high on the bluffs on the West Coast of Wisconsin overlooking Lake Pepin on the Mississippi River, about two and a half miles from Stockholm, four and a half miles from Maiden Rock, and sixty miles from the Twin Cities. We own 126 acres of woods, pasture, ponds and crop fields, where we make our home and raise grass-fed beef, pastured poultry and our two busy little boys. Avodah is a Hebrew word whose meaning encompasses labor, worship, and service. This is exactly what farming is to us: hard, meaningful, fulfilling work through which we respect our Creator and serve our community. We strive to be faithful stewards of Creation, living out the Jewish principle of Tikkun Olam (Repairing the World) by rebuilding our topsoil, our local economy, and the connections between rural and urban areas. We hope you will join us on this journey and we look forward to being your farmers! Avodah Farm is the labor of love of Martha and W. Geoffrey Black, along with their sons Elijah and Samuel. You could say farming was in our blood: we both grew up on homesteads where we learned from our parents how to grow our own food. We met as teenagers in 2002. Martha is Jewish, Geoffrey was raised a Quaker, but we both had in common a passion for good food, honest work and life on a farm. After graduating from collage and getting married in 2010, we dove right in to farming by starting our vegetable CSA in 2012, which we ran for five years on three different properties as we searched for a farm to call our own. Elijah Joseph was born in January 2013 and Samuel Akiva was born in December 2015. Having children has only strengthened the commitment we've always had to use only organic practices on our farm, so that our family and your family can both enjoy the fruits of our labor knowing that the food we grow is safe both for you and for the environment. We believe that our children should be able to pick any vegetable (or weed, or handful of dirt) straight from the field and put it in their mouths without fear, and that our customers should rest assured that the produce, meat and eggs they buy from us contain only the goodness of clean air, water, soil and sunshine. Our farming is guided by our goal to leave the next generation a healthy farm in a healthy community, bursting with vibrant diversity. At the end of the day we love being farmers for the same reason we love being parents: There is no work more fulfilling than the work of nurturing life—whether it's a flock of baby chicks, a diverse pasture filled with dozens of species of grass and flowers, the billions of microbes in a handful of rich topsoil, or our two wonderful, energetic and curious sons. We started Avodah Farm on family land in the fall of 2011. After some moving around Pepin County in search of the perfect spot, in the fall of 2014 we bought our own farm in Stockholm, Wisconsin and we are looking forward to putting down roots and never moving again! We affectionately call our land "Dayenu," a Hebrew word that means "it is enough to us." Our farm is a mix of crop land, open and semi-wooded pasture and forest. We have five ponds, eight erosion-control dams, a steep ravine full of ferns and mossy boulders, a spring and a couple of caves. We feel incredibly blessed to have such a special place to call our home, and we are dedicated to the stewardship of our land through organic practices, rotational grazing, cover cropping, perennial crops and long hikes. We farm using no chemical fertilizers, herbicides or pesticides. Ever.